From Hannover Messe: It is estimated that in the next two years, revenue from Augmented Reality and Virtual Reality hardware and software is set to explode from from just under four billion to almost 20 billion Euros . Investment firm Goldman Sachs even forecasts that virtual and augmented reality will change the world just as much as the smartphones. By 2025, total annual revenue in this sector is to reach 80 billion US dollars. That would make the market as big as the desktop PC market today. While there are many applications of VR, one of the key applications is around factory operations. Machine maintenance, and complex factory situations can be simulated or modeled using VR and AR. 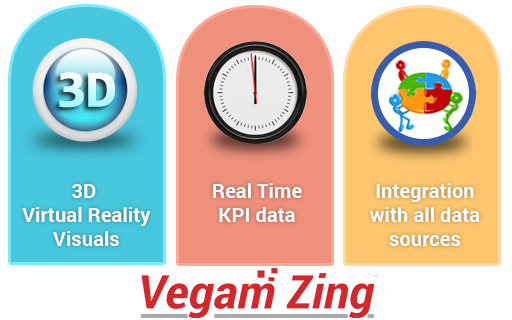 Vegam Zing™ is a ‘3D Virtual Reality framework with Real Time Data overlay’. 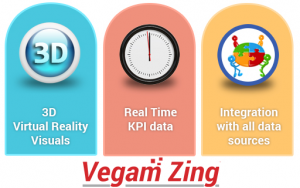 Vegam Zing™ brings out the crystal ball for business decision makers through advanced analytic and data visualization techniques. Powered by a unique gaming engine, it creates a multi-layered, three dimensional, True View , 3D Modeled View and Virtual View, showing overlaid real time data for customized KPIs. The result – faster and better decision making. For further details, visit our website http://vegam.co/zing. Meanwhile at Hannover Messe, one can see how virtual reality and augmented reality will continue to change product development in corporations and medium-sized companies in Halls 6, 7 and 8. There has been a great deal of focus on improving efficiency through automation, especially in manufacturing. Industry 4.0 has brought upon the other aspects of being smart – real time, connected cyberphysical systems generating data, and analytics that delivers decision support and applications that help ‘act’. After first three generations of making smarter machines, smarter processes that include machines, material, processes and events working in tandem to achieve business goals are the key for success. Whilst being comprehensive, IOT has become an essential part of ‘intelligence’ in machines. 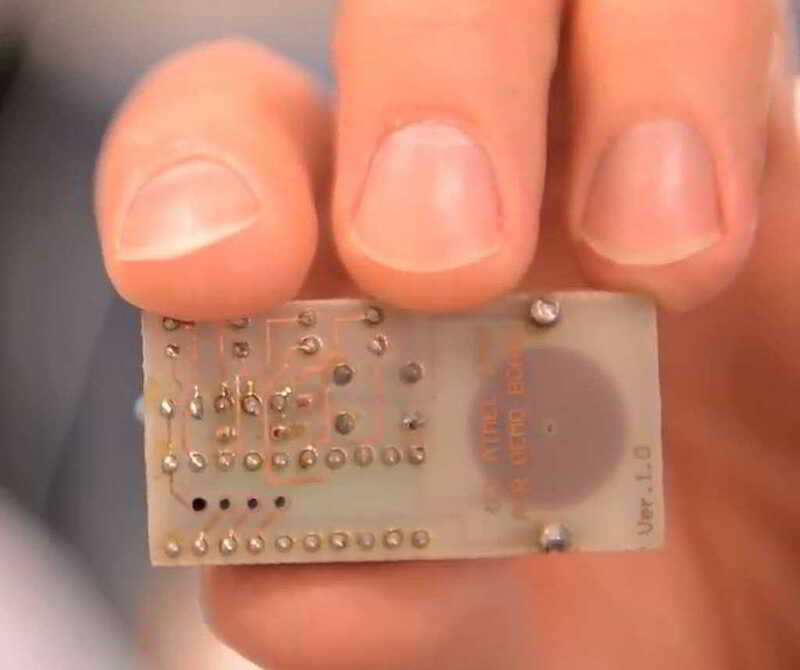 With mechanization, and electronics evolving into more intelligent levels – devices, especially sensors that can record and transmit vital data back to applications or users have made the machines or the ‘things’ more evolved. 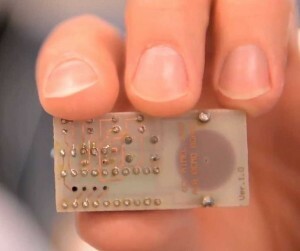 These ‘things’ not only now just are intelligent, they infact gain life – by becoming interactive. Interactive things are basically devices or sensors that can share inputs and act, in many cases, with basic intelligence. This evolution is possible in many use cases – like pressure valves. The pressure valve sensor can transmit status data, but also can be used to shut down if remotely controlled. Such ‘active’ intelligence of the ‘things’ will be used in more hazardous cases with extreme care. Recently, we got an enquiry from a Japanese pharma major who are willing to look at remote control of high pressure valves in a ‘lights-on’ scenario. The evolution of things, if you are a manufacturer, will be a serious factor to improve risk avoidance at the shop floor level, and ‘act’ in critical situations. In short, it is time that ‘things’ become your business. Ashok is a Business Strategist with Vegam Solutions. For more details email us at business@vegam.co. Singapore PMI : Strong case of Industry 4. Contracting manufacturing economies, which are measured by PMI’s, would need to focus on building operational efficiencies, while waiting for manufacturing demand to improve. Germany has already started to advocate adoption of Industry 4.0 across its industries to rejuvenate its economy –the health of which is reflected by PMI’s. Purchasing Managers’ Indices (PMI) are economic indicators derived from monthly surveys of private sector companies. Singapore Institute of Purchasing and Materials Management publishes the Singapore Purchasing Managers’ Index (PMI) on a monthly basis. Manufacturing activity in Singapore contracted for the sixth straight month in December 2015 amid a further decline in new orders and new export orders as well as production output. The latest Purchasing Managers’ Index (PMI) reading released on Monday (Jan 4) came in at 49.5, an improvement from the November reading of 49.2. A reading above 50 means that the manufacturing economy is generally expanding, while a reading below 50 indicates contraction. 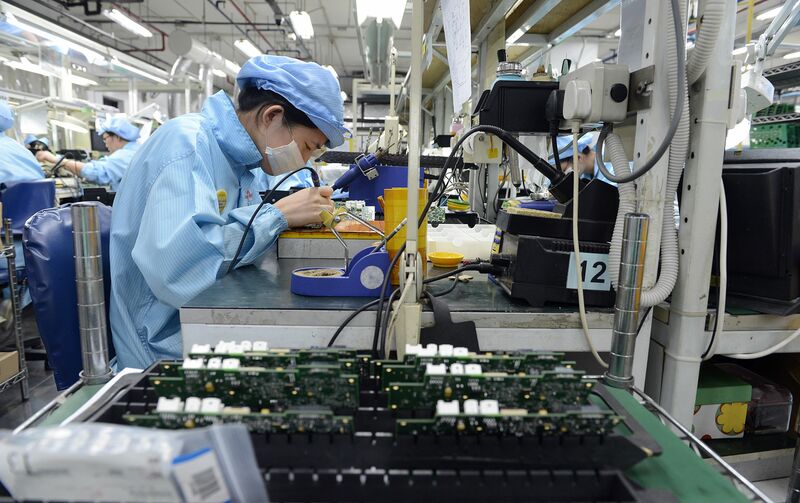 Manufacturing activity in the electronics sector also contracted in December, with the PMI coming in at 48.9, a slight dip from November’s 49.0. This is the sector’s sixth consecutive month of contraction amid a further decline in new orders from domestic and overseas markets. According to Dr Tan Khay Boon, a senior lecturer at SIM Global Education, it is not surprising that the electronics segment remains the sector’s weakest link. “It continues its declining trend with no clear turnaround in sight. It will require a large surge in external demand to take the manufacturing sector out of the woods,” he said. Production output contracted, but inventory expanded in the latest PMI. The key here is to create a lot of flexibility and performance-orientation of existing manufacturing processes, he added. Industry 4.0 comes into play in this context. Industry 4.0 creates highly flexible production networks that allow for real-time optimization of the production process. This not only increases productivity, but it offers the possibility to produce individual goods for the costs of a mass product. In addition, the energy and resource consumption of factories can be reduced, which supports sustainable growth. The importance of Industry 4.0 is already being realized in Germany. For an economy that needs a sustained intervention of growth, Industry 4.0 is a boon to Singapore’s manufacturing economy. Our own conversations with SIMTech, IDA and Singapore Manufacturer’s forum have led us to believe that Singapore’s manufacturing ecosystem have realized the importance of ‘being prepared’ to reskill the workers, create real-time and connected cyber-physical environment. There are lot of advocacy groups now trying to create the buzz. These positive signs are hopeful signs of the Singapore’s manufacturing economy’s push for Industry 4.0 – which is a proven ‘tonic for a better PMI index’. 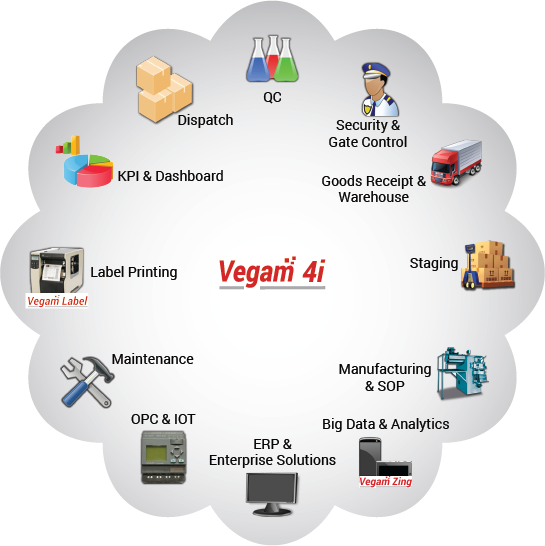 Vegam 4i enables a ‘Digital Factory’ through connecting silos of information and processes within the factory fences. Digital Factory, according to the Hannover Messe website brings about ‘intelligent integration’. Intelligent integration focuses on the confluence of Electrical, Mechanical Engineering and Information technology. By bring together these disciplines, the integration of processes across the manufacturing value chain results in a smarter factory. From the supplier to the shop floor, from production to customer, the entire process is networked and integrated. The fact is that ‘real time and connected’ factories enable to create increased transparency at the shop floor. Vegam 4i, a leading industry 4.0 platform brings together some of the key manufacturing processes together INSIDE the factory. 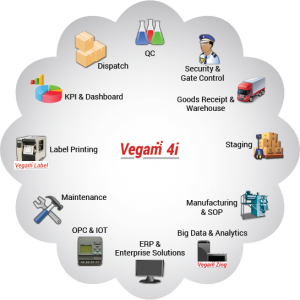 From Goods receipt to dispatch, Vegam 4i platform connects various systems including ERP, machine data and operator inputs to help present real time data dashboards that help shop floor managers to manage operations and decide on approval dynamically. With the ability to interface IOT sensors, PLC controls, handheld inputs and also interfacing with ERP – the main objective of removing data and operational silos is achieved. Vegam 4i has achieved this in many factory scenarios especially in complex and hazardous chemical production plants. “People who prepare for the future by harnessing modern technology to their needs will gain a competitive edge in the medium to long run.” -Heinz Gaub, Managing Director at the mechanical engineering firm Arburg GmbH + Co KG, as the Hannover Messe website indicates. The need to integrate and address the ‘last mile’ in the shop floor is a key step in achieving ‘Digital Factories’. This will enable nimble, visible and transparent decision making at the manager / supervisor level and empower the operator to act real time on exception scenarios. The main theme of Hannover Messe, the world’s largest Industrial fair is Industry 4.0. Vegam Solutions, a leading Industry 4.0 solutions provider is participating in the fair. We have always been saying this. The world is moving towards Industry 4.0. Every manufacturing industry, especially which has customized demands from the customer has to go through an adaptation that is key for survival and success. Now, this cannot be more pronounced when the mother of all industry fairs, Hannover Messe focuses on Industry 4.0 as flagship theme. Now let us look at Hannover Messe – the world’s main industry fair before we talk about Vegam’s journey to Hannover Messe. As quoted in Wikipedia – ‘The Hannover Messe (HM; English: Hanover Fair) is the world’s biggest industrial fair. It is held on the Hanover fairground in Hanover, Germany. Typically, there are about 6,500 exhibitors and 250,000 visitors. The Hannover Messe started in 1947 in an undamaged factory building in Laatzen, south of Hanover, by an arrangement of the Britishmilitary government in order to boost the economic advancement of post-war Germany. The first fair was colloquially known asFischbrötchenmesse (Fischbrötchen fair) due to the exemptions in food rationing for the fair at this time. It proved hugely successful and was hence repeated on a yearly basis, contributing largely to the success of the Hanover fairground in replacing the then-East Germancity of Leipzig as the new major fair city for West Germany. In the 1980s, the growing information and telecommunication industry forced the organizer Deutsche Messe AG to split the fair. TheCeBIT is a successful spin-off of the Hannover Messe. This year, Hanneover Messe is focusing on Industry 4.0. The theme covers various tracks – Industrial Automation, Industry 4.0, Robotics, Digital Factories among many. The success of Hanneover Messe has been its structure and sense of purpose. It has four tracks – Exhibitions, Conference & Forums, Investment Lounge and Hosting Delegation and lead generation. These tracks ensure that the participants get their value for money depending on their networking and participating objectives. Our participation is to explore, learn and share our experiences in Industry 4.0 with the other participants in the biggest stage of the world. Watch this space for more, as we share our experiences leading upto our participation in Hannover Messe. canada goose uk shop At the same time as acclaimed Czech composer Antonin Dvorak was finalising the score of his New World Symphony, he was also causing a stir in the newspapers of New York and Paris by asserting that in the music of black America there was “all that is needed for a great and noble school of music.” Out of step with many at the time, Dvorak was tapping into a rich seam of black creativity that is rarely heard or written about today. For BBC Radio 3 Mahan Esfahani heads to the USA to ask why we know more about Dvorak’s statement than the history of African American classical music. He traces the roots of black American classical music to before emancipation, and through archives and orchestras discovers the histories, triumphs and obstacles faced by these early composers canada goose uk shop. Gifted athlete Geoffrey Foy died after being hit by a car driven by Libyan Hawada Ali Sharfeden.But the 30 year old motorist escaped with a curfew and a fine which district judge Alan Berg accepted did not reflect the “appalling outcome of his appalling driving”.The limitations on his powers of sentencing were “regrettable”, he said.The Libyan, from Elizabeth Street, Cheetham Hill, Manchester, had falsely claimed to his insurance company that he was British and held a British licence, invalidating his cover.He pleaded guilty to making a false statement, driving without due care and attention and speeding, and was fined and ordered to obey a curfew between 7pm and 6am for 12 weeks.Mr Berg said: “Whatever I do it cannot begin to restore in any measure at all the loss this boy’s family has suffered. Their grief is immeasurable.”In an unusual move he spoke to them in private to express his condolences and explain the sentence.Geoffrey, a pupil at Brookway High School, Wythenshawe, and a star player for Stockport based Vale Rangers who had also just been invited to join Sale Harriers athletics club, was hit as he was crossing Brownley Road, Wythenshawe, close to his home in Solway Road.His father, also called Geoffrey, 37, said: “There is obviously a grey area here between due care and attention and causing death by dangerous driving.”The judge clearly would have preferred to be able to deal with him more harshly and we believe he should have gone to jail.”It wasn’t a straightforward accident where someone runs out in front of a car which is being correctly driven and has no chance. This was a man who lied about having a licence, was driving illegally and who has accepted he was speeding.”Mr Foy added that he and his partner were on anti depressants and he had been unable to work for the past 12 months.”I feel that my whole world stopped with him dying it totally destroyed my life.”Like us on FacebookFollow us on TwitterDaily NewsletterNewsallMost ReadMost RecentGreater Manchester PoliceA day of tragedy on our roads: three people are dead and four are injured in horrific collisionsRob Potts from GMP said the incidents “serve as a stark reminder of the importance of road safety.”M60A teenage boy has died and another remains critically ill after car crashes into cyclists latestPolice were called to reports that a grey Vauxhall Insignia had collided with a bicycle on Oldham Road at the junction with Hollinwood Avenue in Oldham.. Replica Bags The files contained in your phone will appear in best replica bags a window in your personal computer. Scan for the photos or videos that you lost. Then, highlight the file name and open them. Michelle Obama, right, is greeted by Oprah Winfrey to discusses her new book during an intimate conversation to promote “Becoming” at the United Center on Tuesday, Nov. 13, 2018, in Chicago. Former first lady Michelle Obama embraces a student at her alma mater, Whitney M Replica Bags. I told her that she could draw her memory pictures in the book when she got home from her dream vacation because she had to have enough blank pages for the Princesses to sign. As it turned out, her mom had to buy another sketch book for her child to draw in NOW. Get the picture?. canada goose outlet uk If you wrongly apply the law there will be no record for the Court of Appeal to review. Therefore, it is important that you accept the law from me without question. You must not use your own ideas about what the law is or should be. Beer Street, by contrast, is the heaven to Gin Lane hell. Set in Westminster, where canada goose victoria parka outlet trades and crafts are seen to thrive, rather than St Giles where the poverty stricken residents are feckless and unemployed, canada goose outlet in canada it features healthy, well fed canada goose outlet canada labourers at leisure, enjoying large, frothing tankards of the national brew. A newspaper canada goose outlet uk on the table reports a speech by the king recommending Advancement of Our Commerce and cultivating the Arts of Peace Nearby, fishwives with overflowing baskets suggest that a society based on solid, honest mercantile values untainted by that foreign spirit, gin will be rewarded with abundance and prosperity canada goose outlet uk. These transactions usually begin with De Shielding cheap jordans for kids Transactions. Usually performed between a private address and a public address. Here, the transaction cheap jordans canada amount is revealed while the total balance in the cheap jordans kicks private address remains hidden. You can’t breathe, your thoughts are racing, and you might even feel like you’re having a heart attack. You’ve tried medication, but it’s not working like it used to or it never worked at all. Easy natural anxiety remedies simple ways to eliminate your chest crushing anxiety and get your life back. cheap air force cheap jordans china Twenty eight days later, however, instead of bringing legal super cheap jordans for https://www.nikesdunksb.com sale action, it sent another letter with similar language reminding Ranger of the legal ramifications. When the problems weren’t fixed in 30 days, it followed up with more letters on Feb. 1 and Feb cheap air force. He also appreciated that Chief Justice of Pakistan took suo motu of family planning issue.”We would implement the directions passed by the honourable court in letter and spirit” he said. Health Secretary Saqib Zaffer said, “Today is the first step forward for formulation of new health policy. They also wore black armbands during the working hours. Hermes Replica Belt The soothing blue hue of the display is less nightlight and more Colditz searchlight and the choice of radio stations available via DAB at 3am while suffering insomnia are Radio 2 and Al Jazeera.Which brings me neatly on to today’s big story hate preacher Abu Qatada, who is now a ‘free man’ at the taxpayer’s very expensive expense and allowed to stay in Britain thanks to winning the latest round of his deportation battle to Jordan. Not the big breasted model of the same name, but the tiny Arabic country where perfect hermes replica torture is illegal but still widely practised.Some might argue that being married hermes sandals replica to Jordan the model is torture too, but that normally ends in a payday for her latest victim from OK! Magazine. Abu Qatada argues torture in Jordan, where he faces a hermes birkin bag replica retrial for allegedly plotting bomb attacks, would mean almost certain death for him and that’s a breach of his Human Rights.But how would Qatada who has called on British Muslims to kill innocent people argue his way out of a breach on the Human Rights of the victims of any potential future terror attack on UK residents?”A dangerous man, a suspected terrorist,” says Home Secretary Theresa May, who presumably having a bout of Steve Wright induced insomnia and one eye on a contract to accompany Nadine Dorries into hermes bracelet replica the I’m A Celebrity jungle forgot to file the hermes evelyne replica paperwork for his deportation on time and is now defending a ‘catalogue of confusion hermes replica blanket and mistakes’ in the Commons Hermes Replica Belt.